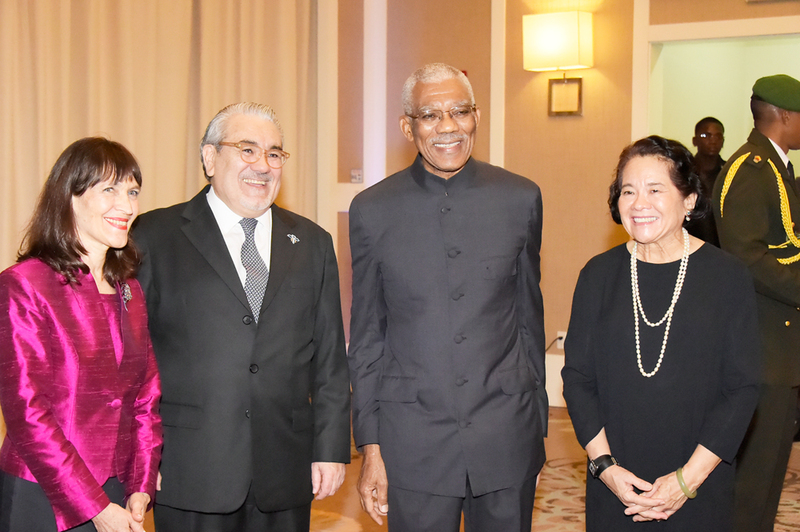 President David Granger, this evening, said that Guyana and Argentina are committed to securing improvement in the quality of life for their peoples and to ensuring peace, security and stability on this continent. “Guyana remains committed to deepening the integration of South America…Guyana considers itself a continental state with Caribbean characteristics. It remains committed to deepening the integration of South America. The infrastructural integration of the continent will allow Guyana to more actively pursue its continental destiny,” he said. Speaking at a reception to celebrate Argentina’s 202nd Independence Anniversary at the Marriott Hotel, the President said that notwithstanding the differences between the two countries, in terms of size and distance, diplomatic relations, established 46 years ago in 1972, remain fruitful, particularly in the areas of culture, health, defence cooperation and sport. “Guyana and Argentina are already collaborating at the multilateral level, particularly within the Organisation of American States, the Common Market of the South, the Union of South American States and the Community of Latin American and Caribbean States. “Guyana and Argentina, through their participation in these organizations and within the United Nations, have been able to advance their common interests, particularly in promoting human rights, poverty alleviation and sustainable development and in the proclamation of the continent of South America as a zone of peace,” he said. The President noted, too, that two countries are both subject to the adverse effects of climate change and said that Guyana looks forward to the working with Argentina to boost the capacity of the small island developing and low-lying states of the Caribbean in the disaster management and climate adaptation. Argentine’s Ambassador to Guyana, Dr. Felipe Gardella, in his remarks said that his country is committed to strengthening relations with Guyana particularly in humanitarian missions such as disaster response. “Regarding the bilateral relationship between Argentina and Guyana, I must say that we have come a long way since the opening of our diplomatic mission in 2011. It is my hope that we can continue to count on your country’s support. We are pleased with our projects particularly in public health and the restoration of the pictures in the National Gallery,” he said. Ambassador Gardella also commended Guyana for its unique diversity and the peaceful coexistence of the difference ethnic groups and religions, which he said is a blessing in a fast changing world. The Declaration of Independence of the United Provinces of South America on July 9, 1816 ended three hundred years of colonial rule. Argentina’s emergence was part of the liberation wars, which led to the disintegration of the Spanish Empire in the western hemisphere.